Bruce Willis stars as Dr. Paul Kersey in a remake of the 1974 film, Death Wish. There are many people who consider Willis as a skilled actor - while others would say he routinely has relatively little variation of his facial expressions. Regardless of how you may feel about Mr. Willis, this film, or his typical genre, you probably are aware that many actors have a few "go to expressions" for which they are known. One of Willis' default faces can be seen during 0:21 - 0:23 in the film trailer shown above. A cropped close-up of his expression is included below. 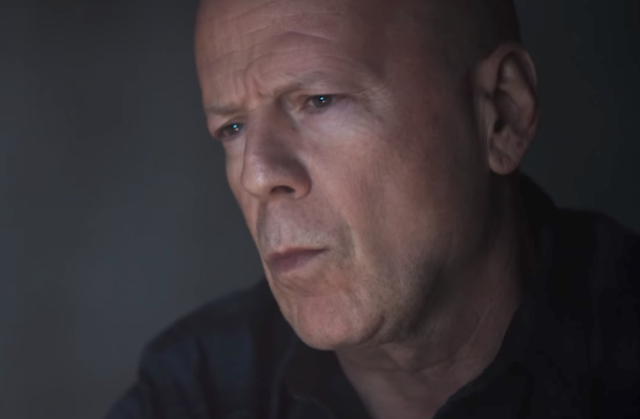 When looking at Bruce Willis' upper face, we see that eyebrows are drawn together and the inner (medial) portions are also vectored downward. His eyelids are also partially closed. There are no dynamic furrows in either lower eyelid. Rather, his lower lids are significantly tense. This eye-region cluster is indicative of critical evaluation mixed with lower level anger. Now looking at his mouth - it's configured in what is known as a "Forward Lip Purse" (not to be confused with a "Lateral Lip Purse", which has a completely different meaning). Forward Lip Pursing is an indication of clandestine disagreement and/or a clandestine plan. A forward lip purse is only made by individuals who feel that they are a relative alpha to those beta personalities with whom they're thinking about, conversing with, interacting, etc. Moreover, they also believe that their plan has a significant likelihood of success. Next, make this exact expression yourself. Do so in front of a mirror until you get it just right. How does it make you feel? As part of this exercise, turn off any lights, so that you (presumably) have the same expression in the dark. This temporary sensory deprivation will allow you to focus on any emotions more easily. Making this expression should, very readily, elicit the same emotions described above.